These hotels have dreamed up only-in-NM packages to make themselves extra-tempting in the busiest time of the year for vacations. Whether your interests are more culinary or cultural, urban or outdoorsy, in learning or luxury, this state has seasonal travel packages for all dispositions. THE DEAL Golf Stay and Play Package From $99/person, includes overnight stay at the resort and a round of golf (including cart). Test your skill on the green, and your luck at the casino. THE SPOT An upscale resort and casino with three newly improved 9-hole golf courses amid the spectacular high-desert views of the Pojoaque Valley, 15 minutes north of downtown Santa Fe. THE DEAL Opera Lovers’ Package Includes transfer to and from the nearby Santa Fe Opera, three-course pre-show dinner for two or picnic tailgate dinner, and backstage tour. THE DEAL Just for Two: Summer Spa Package Two or more nights with breakfast, one massage per person. THE SPOT Private casitas and suites in the Sangre de Cristo foothills, just minutes from Santa Fe. Daily shuttle to downtown Santa Fe included. THE DEAL Flavors of Santa Fe Package Two-night stay including demonstration class and lessons in making chile at the Santa Fe School of Cooking and a copy of the school’s cookbook, Celebrating the Foods of New Mexico. $548–$688, based on double occupancy. THE SPOT Boutique hotel on the edge of Santa Fe’s popular Railyard District. Stay in style while learning the secrets of authentic New Mexican cooking. THE DEAL Chocolate Lovers’ Delight Explore Santa Fe through its ancient and modern connections to chocolate, made with local ingredients and traditional techniques. Package includes accommodation of choice, fireside chocolate martinis in the lounge, chocolate indulgence spa treatment, and walking map of Santa Fe’s chocolate trail. Prices start at $429. THE SPOT Landmark hotel modeled after Taos Pueblo, adjacent to the historic Loretto Chapel in the heart of the city. THE SPOTS In alignment with the capital city’s “Summer of Color” programming (see mynm. us/artsumclr), these four hotels are offering a series of hue-specific specials this summer. All include a 15 percent discount on standard rooms and two Museum of New Mexico day passes. THE DEAL Eldorado Hotel & Spa’s Gold Package Two Spun Gold Massages from Nidah Spa, Gruet Sparkling Brut Champagne, Gold Pyramid Chocolate Candies, biscochitos, and red chile honey. THE DEAL Hotel Chimayó de Santa Fe’s Red Package Includes New Mexico red wine, chips and salsa, red chile popcorn, and a mini red ristra. THE DEAL Hotel St. Francis’ White Package Includes New Mexico white wine, white popcorn, and white truffles. 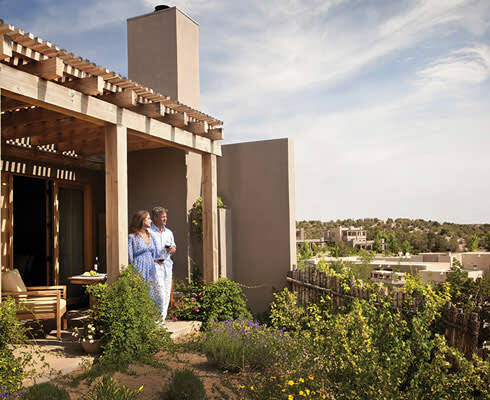 THE DEAL The Lodge at Santa Fe’s Sandstone Package Includes six-pack of local beer, biscochitos, chips and salsa, chocolates, caramel popcorn, and piñon coffee. THE DEAL Río Grande Paddling Adventure For $65 added to your room rate, book a three-hour guided canoe or kayak tour of the river with Quiet Waters Paddling Adventures. THE SPOT Historic inn and organic farm on 25 acres near the Río Grande in Los Ranchos de Albuquerque. This pastoral oasis, so close to the city, offers world-renowned farm-to-table dining and loaner bikes, too. THE SPOTS Native-themed Nativo Lodge and classic New Mexico–fusion Hotel Albuquerque at Old Town. THE DEAL Balloon Adventure Package Want a bird’s-eye view of this vast landscape? Be transported by a luxe one-night stay and a morning flight for two with Pueblo Balloon Company’s FAA-certified pilots. THE SPOT Luxurious property with a Native American theme. THE DEAL Summer Workshops Multi-day and weeklong courses in travel journaling, mixed-media art, creative writing, photography, and more; check website for details. THE SPOT The historic adobe residence of famed arts patron and writer Mabel Dodge Luhan continues to be a haven for inspiration. THE DEAL Museums of Taos Package Room rates discounted by 20 percent, breakfast and tickets to five local museums included. THE SPOT Elegant bed-and-breakfast with a sleekly executed “Remarkable Women of Taos” theme, including rooms inspired by Agnes Martin, Millicent Rogers, and more. THE DEAL Simple Summer Coupons $30 off all rooms in June, $30 off any room when you fly Boutique Air (a small airline that flies from Dallas, Clovis, and Albuquerque to Silver City), two-for-one lunch with any stay, and more. THE SPOT Quiet, upscale accommodations with good art, delicious breakfasts, hiking trails, and gracious hosting, on 178 acres on the outskirts of town. THE DEAL New Mexico Wine Weekend Getaway Deluxe room, a bottle of New Mexico wine, fruit and cheese plate, maps of local wineries, breakfast, and discount card good at local shops and venues. THE SPOT Spacious, Spanish Colonial–themed property whose summertime perks include a tropically landscaped, Mediterranean-inspired pool area and Azul, a stylish on-site lounge and nightclub. THE DEALS Summer Stay and Play—Golf, Mountain Biking, or Escape One night with breakfast for two, two rounds of golf, two margaritas, and two golf gifts; $268. Or substitute unlimited Ski Apache gondola rides and 20 percent off bike rentals; $209. The Summer Escape Package offers one night, two breakfast buffets, two margaritas, and an appetizer for $169. Offers available Sun.–Thurs. 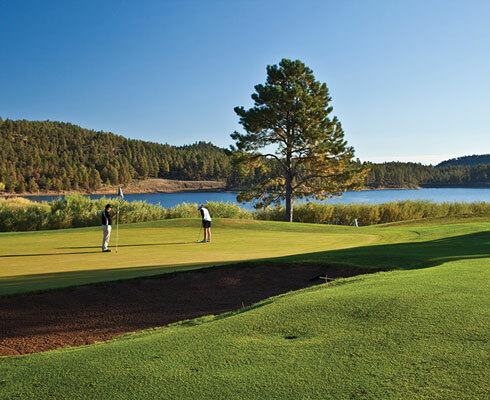 THE SPOT A Mescalero Apache–owned lake-side resort, casino, and golf course surrounded by mountains. THE DEAL Golf Getaway Package For an extra $49–$59 this summer, add one round of golf per person at Links of Sierra Blanca Golf Course for each night’s stay. THE SPOT A well-rounded hotel and resort with views of the Sierra Blanca and Sacramento Mountains. THE DEAL Summer Festival of the Arts Workshops An array of weeklong courses covering all manner of arts, from pastels to silver to beads and clay. Check the online summer workshop catalog for these and other options. THE SPOT No-frills accommodations on Georgia O’Keeffe’s home turf, in the rugged landscape memorialized in her paintings.